Local Monterey County birders consider the Big Sur River mouth and Pt. Sur a wonderland for birds, and in their heads they have combined two state parks (Andrew Molera State Park & the Pt. Sur Lighthouse State History Park), plus intervening private land (El Sur Ranch) into a huge birding area known as the "Molera/Pt. 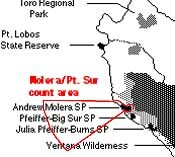 Sur listing area," or "the Molera list" for short. The landmark Pt. Sur (above) anchors the north end of the zone while Andrew Molera State Park encompasses the southern end. Andrew Molera State Park has a substantial wilderness in the little-visited "back country" but its primary feature is the mouth of the Big Sur River (below). Birders also include in the zone offshore waters to 12 miles offshore (U.S. international sovereignty boundary). Access to Pt. Sur, the offshore waters, and El Sur Ranch is extremely limited or infrequent, but Andrew Molera State Park is open to the public all the time (directions farther down this page). The following photos and text provide an overview, but a detailed spot-by-spot discussion of where to bird at Andrew Molera State Park is on-line on Craig Hohenberger's web site; it features a "Birding Molera" article written by Craig and Jeff Davis, plus a detailed park map, photos, and more. 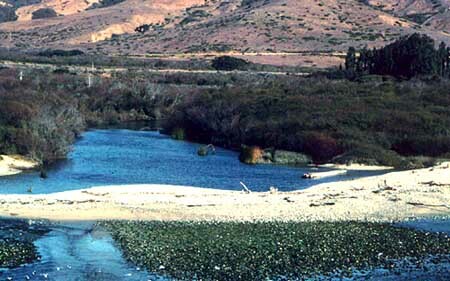 The Big Sur River reaches the Pacific Ocean at a lagoon created by a sandy bar (the river flows to the sea just left of the photo). The few ducks that visit this stretch of coast often land in the lagoon. At low tide (as in the photo) there is a small shingle bar seaward of the sand, one of the few areas used by roosting gulls or feeding shorebirds (there is another gull roost visible from Molera Pt. to the north on private land). Although this photo (left) was taken in winter when many deciduous trees are bare, you can still see the extensive willow habitat on both sides of the river mouth lagoon. Trails on both the north (left side) and south (right side in this photo) banks of the Big Sur River lead to these riparian habitats. The one on the north side of the river mouth itself is called by birders "the headlands patch"). This photo is taken from Molera Pt. (the "headlands" itself) and the trail to this spot switchbacks up from the "headlands patch" just beyond the left side of this view. Also visible in this shot is Highway 1 in the top background, and in the upper right is the eucalyptus grove that surrounds the Cooper Cabin. Tthere is a trail from a parking pull-out on Highway 1 to the Cooper Cabin, and that trail then connects with the main trail along the north side of the Big Sur River. Upstream from the mouth the Big Sur River curves to the south and then winds into the Santa Lucia Mountains where almost all of its watershed is protected within the Ventana Wilderness of the Los Padres National Forest. This view (right) looks south up the river just as the morning fog is burning off. In the front left is a heavy riparian forest of cottonwoods, willows and sycamores. The Big Sur Ornithology Lab is located within this riparian forest, and their nets are mostly within the riparian zone. [The Big Sur Ornithology Lab ("BSOL") is operated by the non-profit Ventana Wilderness Sanctuary; see the VWS website for many more details on BSOL and their other environmental activities, including California Condor and Bald Eagle recovery programs.] Upstream of BSOL the Big Sur River flows through redwood groves in the southern end of Andrew Molera State Park and then through the popular Pfeiffer-Big Sur State Park. 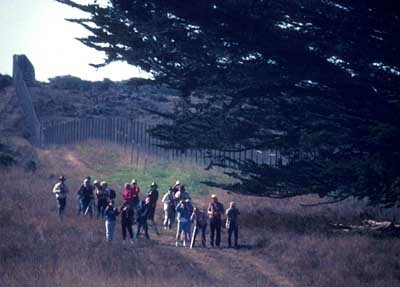 [Birders do not consider Pfeiffer-Big Sur to be part of the "Molera list" area.] 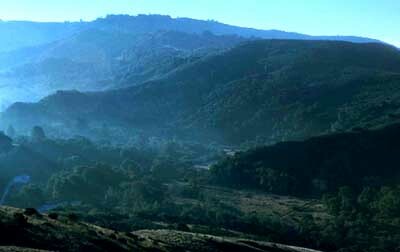 To the east (out the left side of this photo) there is much rugged chaparral, grassland, and coniferous wilderness within Andrew Molera SP, including the upper end of the south fork of the Little Sur River. The maps below show the general outline of the "Molera/Pt. Sur" listing area: Andrew Molera State Park, the Pt. Sur reservation and lighthouse, the connecting private land between, and offshore waters to 12 nautical miles. Little Sur R. mouth lagoon (good overlook at 16.7; major gull & pelican roost at river mouth. Beach is private property). Andrew Molera State Park itself has a large main parking area, but there is an entrance fee ($3 currently but subject to change; see the State Park web site). The main parking lot is on the north side of the river. From here you can take the major trails, or walk the dirt road upstream (under the arch promoting horseback trail rides) just a few hundred yards to the BSOL lab facilities. Except during flood stage in winter, a wooden bridge leads from the main parking lot to the south side and then west to the beach (~1 mile walk), and there is also another bridge from in front of the BSOL lab to the south side of the river. All these trails connect. There is a walk-in campground (half-mile walk from main parking lot; another fee for camping) along the main trail to the river mouth along the north bank (also ~1 mile walk). An alternative access point to the main trail along the north bank is a wide dirt pull-out on the west side of Hwy 1 about a quarter-mile north of the main State Park entrance. Here a stile through the fence begins a wide path to the eucalptyus grove that surrounds the Cooper Cabin (a historic cabin of an early pioneer that has been rebuilt). Here this trail joins the main north bank trail. The walk-in campground is a just few hundred yards upstream (to the left) and the Molera Pt. headlands are about a quarter-mile to the west (right). There is a green port-a-potty on the left side of the trail just at the entrance to the "headlands patch" which is a large expanse of willows at the river mouth along the north bank. rocky sandbars that develop in the river following winter floods. The river often changes course from year to year, so these areas come and go. In 1999-2000, there is a fine rocky bar at the end of a short trail that goes south from the green outhouse at the entrance of "the headlands patch." Vagrant nighthawks & wagtails have occurred. In addition to all these spots near the river mouth itself, the Big Sur Ornithology Lab, just upstream from the main parking lot and about 1.5 miles from the mouth, is an essential birding stop. 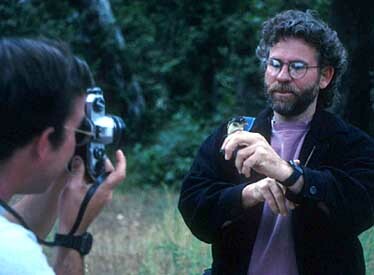 BSOL was founded in 1992 by Craig Hohenberger (holding a Least Flycatcher, above) through the auspices of Ventana Wilderness Society. 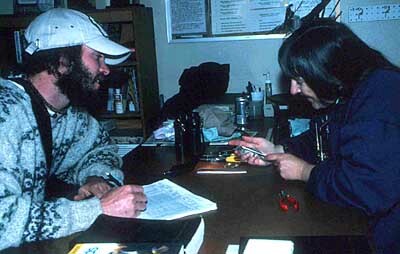 Hohenberger, still the BSOL dircetor, and Jeff N. Davis, on-site coordinator 1992-1995, began the important banding operations. Jim Booker was the banding coordinator 1995-2000. Since fall 2001, the lab Coordinator has been Sarah Hamilton. A large redwood barn houses the office and schoolroom for education programs. BSOL's nets are operated for 5 hours every morning spring through fall, and less frequently in the rainy winter months when the river can be at flood stage. Visitors are welcome but large groups should book in advance (831-624-1202). Small landbirds are the primary species banded; BSOL processed over 50,000 birds of 160 species in its first 8 years. Each netted bird is extracted from one of the 20+ nets & brought to the lab for processing. There it is measured, weighed, aged & sexed (if possible) and checked for details of molt and breeding activity. In this photo (right) volunteer Rita Carratello measures a Hutton's Vireo while BSOL Associate Coordinator Jason Scott takes the vital statistics. The BSOL intern program is invaluable in operating the lab, and provides the interns (most of them recent college graduates from all over the country) with important field experience as they prepare for careers in biological or environmental fields. Volunteers are also vital to the lab's work. BSOL not only operates the lab as a MAPS monitoring station for Neotropical migrants, but oversees research on life history & ecology of resident species such as a color-banded Chestnut-backed Chickadee project underway. BSOL staff, interns, and volunteers also run ancillary net sites at Carmel R. mouth, undertake point counts on numerous transects, and have contracted for environmental research work countywide. Again, see the VWS website for much more information. OUTLYING SITES: The foregoing discussion has focused almost entirely on birding sites within Andrew Molera State Park, and especially those around the Big Sur R. mouth. Indeed, birders tend to use the words "Andrew Molera State Park" and "Big Sur River mouth" interchangeably. Many hot-lines talk about "Andrew Molera" for bird sightings, but in publications I always use "Big Sur R. mouth" (a) because it is a specific geographic locale not subject to name change on the whim of politicians (who can always change the names of parks) and (b) because it is more specific (meaning the river mouth, a couple miles of riparian vegetation, and/or the adjacent mesa). Andrew Molera State Park is a huge 4800 acre park and the vast majority of it is east of Highway 1. This area can be accessed from a trail that goes under Highway 1 near the entrance road and then zig-zags up the steep slope through grasslands, then chaparral, and finally rocky areas on the ridge. It is a hot, steep trail that very few birders undertake, but on the ridge above are some species (e.g., Rock & Canyon Wren, several records of Burrowing Owl) that very rarely occur along the river below. There are also trails into the wild back-country of Andrew Molera SP from Old Coast Road, the dirt road that takes off inland just opposite the entrance to the State Park (this road is impassable during winter rains). All these areas are within the "Molera/Pt. 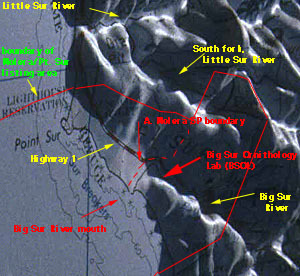 Sur" listing area (at least all the land within the state park, and all of Old Coast Road until it crosses the first major ridge and goes into the next watershed). Pt. Sur itself is a great spot for sea-watching but access is limited to the park tours mentioned above, or the occasional surveys by teams on the Big Sur Christmas Bird Count. Vernal pools at the base of Pt. Sur can be partially scoped from the edge of Highway 1, or have been occasionally checked by BSOL staff with permits. Several great vagrants have been found (e.g., Tricolored Heron, Least Bittern). The private El Sur Ranch and other adjacent private land is not open to the public but BSOL researchers occasionally obtain permits, and these surveys -- plus those at the private housing near Pt. Sur that is also off-limits to the public -- have produced a wide variety of other rarities (e.g., MTY's first Common Grackle during the few years when BSOL interns resided there). Offshore waters (to 12 n.mi from Pt. Sur but south of those areas closer to Hurricane Pt.) have been visited on organized pelagic trips the last few years, generally in October. Most common pelagic species have now been recorded within this zone, plus some rarities (e.g., Flesh-footed Shearwater, Thick-billed Murre). Bottom photo: Pt. Sur in fog, a common summertime occurrence, looking south from near Hurricane Pt. (the lighthouse beacon is visible). All photos on this page are © 2000 Don Roberson (except the BSOL building shot by Jason Scott, used with permission); all rights reserved.